Surrounding yourself with the right people is essential to peer advantage. Peer advantage doesn’t come cheaply, but if you’re in the right group where you share strong values, set clear goals and commit yourself to the other members by giving and receiving — there’s no limit to what you can accomplish. “How will I identify which peers can really help me?” is the question you must ask and answer. You should look beyond mere credentials and titles. Think about how you approach hiring an employee. You look for people who have certain skills, but you’re also critical of how well they’ll fit into your culture. The same thing is true of your peer group. Good groups share a set of beliefs in pursuit of common goals. There are 7 shared beliefs that are essential for a successful group. The group is smarter than any one individual. You may not be the smartest person in the room, but if you’re the boss you may be treated that way. The collective experience in the room is greater than any individual in the room. You may diminish your team if you always think you have to be the smartest guy in the room. Once you believe in the collective knowledge of the group, you can stop judging and start learning. Leaders benefit from insightful questions and advice from their peers. Hard questions can be asked in a group setting. Your fellow members care about your success, but without skin in the game they’re free to ask unfiltered questions, offer impartial advice and share experiences. Great questions and unfettered advice and feedback help members build trust and extend their relationships beyond the group meetings. Leaders, regardless of industry, share aspirations and challenges. Common practices in one industry might be unheard of in another one. Sharing ideas and practices across industries can be powerful for CEOs and business owners. People prefer to implement their own solutions. There’s a difference between what you get from a consultant and what you get from a group of peers. Both can be valuable, but when you get recommendations from a consultant you’re left to implement their ideas. When you get insights and experiences from a group of peers you’re challenged to learn from your colleagues and make a commitment to develop and implement your own solutions. CEOs and business owners who own a particular strategy and implement it are more committed to be successful with it. Success is often the best teacher. When something works, you’re more inclined to adopt it or stick with it. Until then you may not trust it. Success can fuel our willingness to change. Listening to and engaging in a peer group can fuel success when people are open to the strengths found in others. Peer accountability is a powerful force. This is a force we all experienced from the time we started school. Teachers understood it, too – what with their carrot and stick approach. Teachers shined a light on the good students while punishing poor behavior. In business, admission of failure to colleagues that you failed them is the toughest admission of all. The respect of your colleagues is your greatest currency. You want to be regarded as somebody will do what they say. It’s a culture of accountability found in a peer group. Shared beliefs are necessary if the group is going to engage in open and honest exchanges, creating a confidential and safe environment for sharing. If you have what it takes, then you’re on your way to realizing the peer advantage. Shared goals are also important. What do you want to accomplish? If you want to run marathons you know to surround yourself with others who want the same thing. THE PEER ADVANTAGE by Bula Network is designed to serve SMB owners who want to grow their business and their own lives as business owners. That necessarily means it’s not designed for non-owners, or owners who are satisfied. That’s how we make sure the conversations are congruent with every member of the group. How will you know if you’re in the right group? Your group will let you know. By their very nature peer groups provide honest and direct feedback. If you’re apprehensive about your interactions with the group, chances are they’re equally apprehensive about you. Typically, many CEO group leaders will do a 90-day check in with members to see how much value they’re getting – and to give feedback on their participation. Good communication is the glue that holds the group together. It’s about giving and receiving. We can all fall into the trap of thinking we’re giving a lot more than we’re getting. When people embrace a different view – one that recognizes all the benefits we’re getting, as opposed to solely concentrating on what we feel we’re giving – then we can avail ourselves of the benefits of the peer advantage. That doesn’t mean you should give more than you receive. It means giving is receiving in more ways than one. In the context of a peer advisory group, if you’re prepared to give 100% of yourself to the group, you’ll get 6, 8, 16 times return from your colleagues – based on the number of members in your group. Each member will, be fully committed to you! • A peer group is smarter than any one individual. • Leaders benefit from insightful questions and impartial advice from their peers. • People prefer to implement their own solutions. Mostly, we don’t want to be told what to do or how to do it. • Success is the most effective means for driving positive behavioral change. • Leaders, regardless of industry sector, share common aspirations and challenges. • Leaders benefit from learning about industry practices not common to their own business. 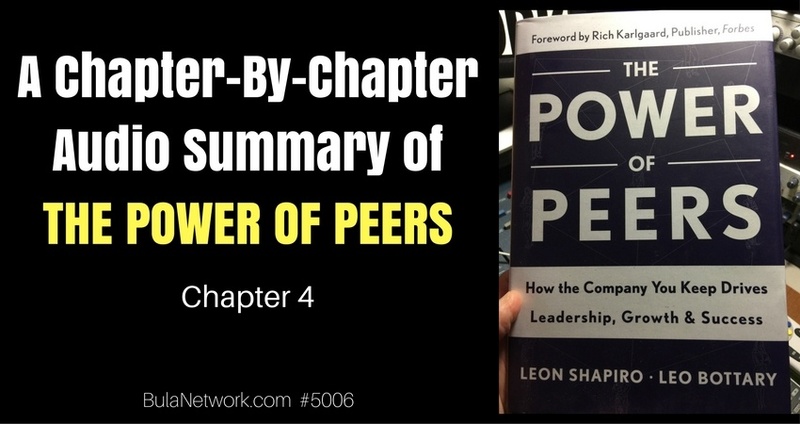 • Peer accountability is a powerful force. The value of your group is negotiated between you and your group members, based on a simple formula: the more you give, the more you receive. Seek out one or more people to connect with based on nothing more than what you feel you can do to serve them. No expectation on what you can get, just focus on what you can give. Let these ideas of sharing experiences, insights and expertise resonate with you. Keep thinking about what you can do for others and think about how much value they can offer your life (and your business). If you own a business – it doesn’t matter if you run a business that does $1 million a year or one that does $300 million a year – and you think a small, intimate virtual group that makes participating in a peer advisory group easy and convenient might bring value to YOU, then email me: RandyCantrell [at] BulaNetwork [dot] com. Next time we’ll dive into Chapter 5 – Create A Safe Environment.